CAPE CANAVERAL, Fla. (Reuters) - Scientists for the first time have found a complex organic molecule in space that bears the same asymmetric structure as molecules that are key to life on Earth. The researchers said on Tuesday they detected the complex organic molecule called propylene oxide in a giant cloud of gas and dust near the center of the Milky Way galaxy. Akin to a pair of human hands, certain organic molecules including propylene oxide possess mirror-like versions of themselves, a chemical property called chirality. Scientists have long pondered why living things make use of only one version of certain molecules, such as the "right-handed" form of the sugar ribose, which is the backbone of DNA. 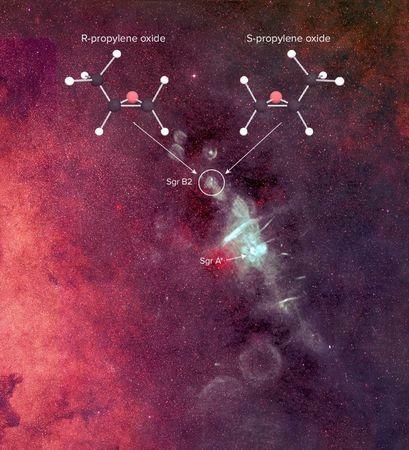 The discovery of propylene oxide in space boosts theories that chirality has cosmic origins. "It is a pioneering leap forward in our understanding of how prebiotic molecules are made in the universe and the effects they may have on the origins of life," chemist Brett McGuire of the National Radio Astronomy Observatory in Charlottesville, Virginia said in a statement. These types of molecules, vital for biology, previously have been discovered in meteorites on Earth and in comets in our own solar system but never before in the enormous expanse of interstellar space. The findings boost the notion that the chemical building blocks for life were delivered to Earth early in its history by celestial bodies like meteorites and comets that incorporated such molecules from space. In May, researchers for the first time found the amino acid glycine, used by living organisms to make proteins, on a comet. The scientists in the new study used radio telescopes to ferret out the chemical details of molecules in the distant, star-forming cloud of gas and dust. As molecules move around in the vacuum of space they emit telltale vibrations that appear as distinctive radio waves. The complex signals tied to propylene oxide were not precise enough for the researchers to determine whether the molecules were orientated to the left or to the right. Like a hand's shadow, "it's impossible to tell if the left or the right hand is casting the shadow," said California Institute of Technology chemistry graduate student Brandon Carroll. Future studies of how polarized light interacts with the molecules may reveal if one version of propylene oxide dominates in space, the researchers said. The research was published in the journal Science. The scientists presented it on Tuesday at the American Astronomical Society meeting in San Diego.